The global network of Counselors presents a rare opportunity for camaraderie and local insight from a fellow CRE member. Friendships can also develop which last a lifetime. A.C. Schwethelm, CRE, Comfort, Texas, and Jon Yamaguchi, CRE, Honolulu, Hawaii, met through their numerous activities in The Counselors. A rich friendship developed, and includes their families, as well. 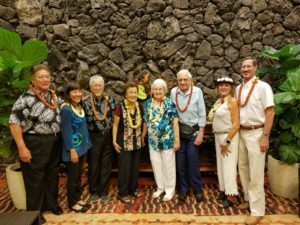 In August, 2018, they celebrated their long friendship—and the birthdays of several family members—in Honolulu, despite the threat of Hurricane Lane. The storm ultimately had no effect on the Schwethelms’ trip, and the festivities took place as planned. You can find contact information for all Counselors in the Members section of the CRE website. A.C. and Marilyn Schwethelm (at center of photo) with Jon and Stephanie Yamaguchi (far left) and other family members of both Counselors.